As part of Trinity’s Eating Disorder Friends and Family Support Group, a One Day Carers’ Workshop has been rearranged for Saturday 23rd June. 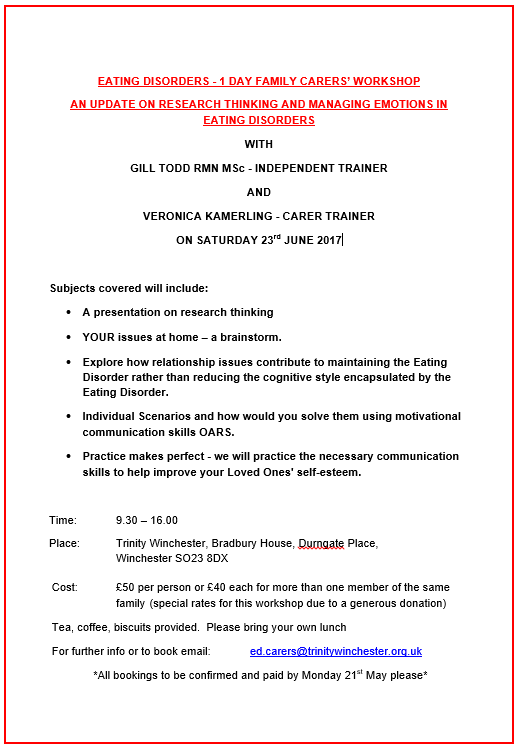 Topics will include a presentation on research thinking; relationship issues which can contribute to maintaining the eating disorder; how to solve individual scenarios with motivational interviewing, and practising communication skills to improve your loved one’s self esteem. Veronica and Gill are highly experienced and qualified trainers. Due to a generous donation we are able offer this workshop at an affordable rate – £50 per person or £40 each for more than one member of the same family. To book or for further details please email ed.carers@trinitywinchester.org.uk.